Diane Dean White is planning a book launch on Facebook. I’ve been to a number of Facebook launches and have seen a variety of different types. The best two I attended? Jody Bailey Day and her release, Washout Express; Karla Reisch Akins and her release, The Pastor’s Wife Wears Biker Boots. The reason these two were a success was the simple fact they both had control of the FB page and the comment thread, which is so important. They gave away prizes every 10-15 minutes, asked questions so their readers were involved, and mostly reminded visitors where to go for the next comment. Guests will get lost if people are commenting on different threads. It can be wild! Some launches are way too long. Sixty to ninety minutes is long enough for a live launch. Readers tire if it goes on and on. They want to ask questions, and many times new writers are present and interested to learn about the craft. Sharing photos of the area where the story takes place is good for just so long; waiting to give away prizes until the end tends to cause guests to lose interest. They want to see it happen as part of the excitement. If other well known authors are present, it’s nice if they are recognized and can answer some brief questions. I attended a launch recently that wasn’t on an event page. We were sent to see a video the publisher provided, and the author spoke LIVE. It was fun, but not as personal….and hard to ask questions since one had to sign-up and enter a username and password with the publisher. I saw a number of comments from the author’s FB page saying many people couldn’t connect. The video launches are getting popular, but are often difficult to hear. They freeze and you lose words and sentences, so it’s not like a comment thread where you can read instantly when someone says something and see the reply. Although you do have to refresh with comment threads, they can be fun. And you can return and reread. Another type of launch isn’t on one particular day, but seems to be quite popular. These can take a week or a month and are geared toward a theme. One example featured Downton Abbey, where the author’s books were written about the Edwardian era. Those who attend go to an event page, post comments and share photos, and take part in an ongoing contest. I was excited about one that took place. I helped promote it on FB and shared photos to talk it up. This brings me to a pitfall. The author emailed me during the time and appreciated my many photos and contributions, but afterwards she never said anything, not even about my new book release. Authors should be willing to help other authors, especially those who’ve been fans and are finally on their way. And another pitfall: beware of problems with the Facebook page comment thread. The comment thread should be one at a time. When you go into the FB launch there should be a question in bold and everyone should comment under that one area. When 10-15 minutes go by and it’s time for a prize, you want everyone there, and then go onto the comment place ABOVE, and tell people to follow. That’s when you start a new thread, ABOVE, so they know where to go. Otherwise people are looking and can’t find what’s going on. I went to one that people were commenting on every comment place possible, and the author didn’t know what to do. Questions were asked and not answered. I’m planning my Facebook launch party. My new release, On a Summer Night, starts out in the late-sixties and then goes to present day. The girls are eighteen on a senior trip when they encounter a bad experience that challenges their faith. Since I describe them getting ready for church and wearing pearl beads and earrings, I’ve got a set for a give-away….and because the story takes place in FL, I have salt water taffy to give away. Among other giveaways is a piece of home-crafted jewelry from author Karen Gass, who has some beautiful designs on her Cotton Spice website. Jody Day told me she waited two weeks before her launch to start to advertise it. That seems right since people are busy and tend to forget. I pray those who take part enjoy it. Good article with some great advice. I haven’t decided about FB launces yet, I suppose my frustration with a few I attended has tainted my opinion. 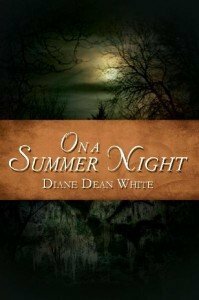 I sincerely wish Diane Dean White success, she’s a great author. If you haven’t read her novel On a Summer Night, get a copy. I’m not very FB savy, but this sounds doable & helpful for promotion, my constant problem. Thanks for the post. to promote what you worked hard to achieve. What a pleasant surprise to see my launch mentioned here! Diane, please keep absent-minded me in the loop regarding your launch. I want TO BE THERE! You were so generous with your time and attention. I agree: writers should ALWAYS pay it forward! Hope you have A GREAT LAUNCH! I’ll keep in touch, my friend. I can see how a FB launch is a good promotional tool to increase visibility and get the word out, but has anyone ever done a followup study to determine if there is a correlation between a launch and actual book sales? I wonder that too! Any input, authors? I’ve seen people give away virtual food, sort of like drinking pretend tea from empty cups as children, I guess. ONE comment thread is an excellent idea, and I think you’re right about being available live. People want to celebrate with the author. Also, two weeks in advance for sending notifications is perfect. How do you confine people to one comment thread, on an event page?